This year in Connecticut we are seriously into celebrating the one hundredth anniversary of Mark Twain's demise. Last weekend The Hartford Courant even published excerpts from its original Twain obituary. A little ghoulish, perhaps, but certainly fitting to the occasion. 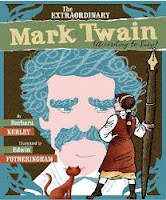 In honor of this big event, I read The Extraordinary Mark Twain (According to Susy) by Barbara Kerley with illustrations by Edwin Fotheringham. Kerley wrote The Dinosaurs of Waterhouse Hawkins, which I liked, being fond of nineteenth century paleontologists, anyway. Kerley and Fotheringham wrote and illustrated What To Do About Alice?, which I wasn't as fond of, since I found the subject to be known for her relationships with men rather than for anything she, herself, did. Ah, but Mark Twain is another matter. Though I don't know how familiar the picture book bio set is with Twain, The Extraordinary Mark Twain (According to Susy) should still have something to offer them. It could be described pretty much as a book about a book, since it's an account of Twain's elder daughter, Susy's, own writing of a biography of her father when she was thirteen years old. The picture book isn't overwhelmed with text, and illustrations carry part of the narrative, just as they should. Kerley works quotes into her story, and they appear not just with quotation marks but in a larger font, making it very clear to child readers that here is something that needs a little extra attention. She also, bless her heart, uses end notes. Interspersed throughout the book are small faux journals which contain excerpts from Susy's Twain biography. In additon to the Author's Note on Samuel Clemens and Susy, there is a page with instructions on how child readers can write their own "extraordinary biography." Seriously, this book could make the center piece of a really neat unit for elementary school students. I hope it does at least as well as Kerley and Fotheringham's last book, What To Do About Alice?, which was a Siebert Honor Book in 2009. Training Report: Mondays are always difficult because of the break for the weekend. It ends up being a tweaking day while I try to get back up to speed. This past Saturday I managed to reread Friday's work, an attempt to improve that situation. I realized that one character needed some work--he's not a Buddhist, he's a yogi. In shifting things around today and finally deciding how to pick up and progress past Friday's stopping place, not only did I not manage any word count at all, I actually lost some. Hey, but quantity isn't always quality, is it?